Beyoncé announces she’s pregnant with twins on Instagram. Jay-Z defends Tidal in a series of Tweets. The rapper, along with Tidal exec Vania Schlogel, holds a Q&A session with students at New York University’s Clive Davis Institute of Recorded Music. He talks about how Tidal gives a higher royalty to its artists. You don’t want to single anyone out, per se — but currently we pay the highest royalty percentage. And there is no free tier service. If you have five people paying for music, and 10 people consuming it, then the artist starts at -5. We start at 1. There is no free tier and we’ll pay the highest royalty percentage. That’s how we’ll change the industry…You guys may have seen some of the stats like, Aloe Blacc had a song that was streamed 168 million times and he got paid $4,000. For us, it’s not us standing here saying we’re poor musicians. If you provide a service, you should be compensated for it. You never hear Tim Cook’s net worth whenever he tries to sell you something. Steve Jobs, God bless, he had to have been pretty rich — nobody’s ever said, ‘Oh, the rich getting richer! I won’t buy an iPhone!’ Yeah, right. It’s not about being pretentious; again, this is a thing for all artists. You pay $9.99 for Spotify, so why not $9.99 for Tidal? We’re not asking for anything else, we’re just saying that we’ll spread that money to artists more fairly. We’re not saying anything other than that, and we’re saying that we’re in a position to bring light to this issue. We’re using our power that way. We come to you with one voice in unity. The first ever artist owned global music and entertainment platform! 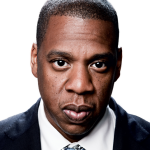 Jay-Z wins control of Aspiro after more than 90% of shareholders accepted the star’s $54m offer. A spokesman for Project Panther Bidco, says all the conditions for completing the acquisition have now been met. The offer is declared unconditional on Friday and Aspiro will be delisted from the Nasdaq Stockholm exchange. Aspiro had 500,000 paying users for its streaming services at the end of 2014, which includes 35,000 subscribers for its “lossless” HiFi-quality music service that is available in the UK under the Tidal brand, a service that costs £19.99 a month – double the price of Spotify in the UK. The company had posted a net loss of $5m for the last three months of 2014, and admitted that it could run out of money at some point this year. The company plans to launch Tidal in 22 countries, mostly in Europe, by the end of March. Knowles closes the awards show with a twenty minute performance. 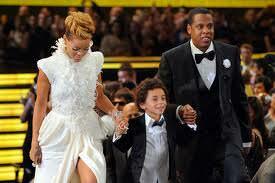 With tears streaming down her face, her husband, Jay-Z, and daughter join her on stage. As she accepts the Michael Jackson Video Vanguard award, which is VMA’s version of life time achievement award, she kisses her daughter and her husband, who calls her the greatest living entertainer. I have nothing to say, but I am filled with so much gratitude. 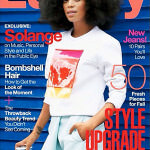 In an interview in Lucky magazine, Knowles says she’s ready to move on following her fight with Jay-Z. What’s important is that my family and I are all good. What we had to say collectively was in the statement that we put out, and we all feel at peace with that. Beyonce and Jay-Z add a second show at the Met Life stadium, on their On The Run Tour. $1 dollar from each ticket sale will go to the Shawn Carter foundation, which helps provide scholarships to students in need, and Beyonce’s BeyGOOD movement. Beyonce and Jay-Z do not attend the wedding of long time friends Kim Kardashian and Kanye West, which is held in Florence, Italy. Instead they make a trip to the Hampton’s in New York for the Memorial Day holiday. Beyonce and Jay-Z release a video for Part II (On the Run). The video is presented as a faux movie trailer and features Sean Penn, Don Cheadle, Blake Lively, Rashida Jones, and Jake Gyllenhaal. Beyonce and Jay-Z release a statement about the elevator attack. As a result of the public release of the elevator security footage from Monday, May 5th, there has been a great deal of speculation about what triggered the unfortunate incident. But the most important thing is that our family has worked through it. Jay and Solange each assume their share of responsibility for what has occurred. They both acknowledge their role in this private matter that has played out in the public. They both have apologized to each other and we have moved forward as a united family. The reports of Solange being intoxicated or displaying erratic behavior throughout that evening are simply false. At the end of the day families have problems and we’re no different. We love each other and above all we are family. We’ve put this behind us and hope everyone else will do the same. On route to the Met Ball Gala after-party, Jay-Z is physically attacked by his sister-in-law, Solange Knowles. Security camera footage shows Beyonce, Jay-Z and Solange entering the elevator with with a team of bodyguards. As soon as the elevator closes, Solange kicks and punches Jay-Z, who blocks the attack. She continues to shout insults and tries to hit him two more times. Beyonce stands against the wall with her hands clasped together. Jay-Z and West wins Grammy for Best Rap Performnace for N****s In Paris. Beyonce and Jay Z perform Drunk In Love during the Grammy Awards show to promote Beyonce’s self titled album. Jay-Z is a Grammy nominee for Best Music Video for Picasso Baby: A Performance Art Film. Timberlake and Jay Z win the Grammy for Best Music Video for Suit & Tie. 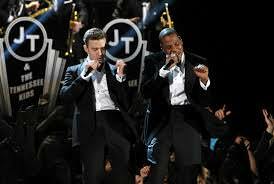 Timberlake and Jay-Z are Grammy nominees for Best Pop Duo/Group Performance for Suit & Tie. Jay Z is a Grammy nominee for Best Rap Performance for Tom Ford. Jay-Z and Beyonce are Grammy nominees for Best Rap/Sun Collaboration for Part II (On The Run). Jay-Z is a Grammy nominee for Best Rap Album for Magna Carta…Holy Grail. 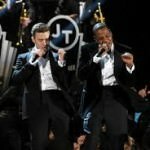 Timberlake and Jay Z perform single Suit And Tie during the Grammy Awards show to promote his album The 20/20 Experience. Jay-Z, The Dream, Ocean, and West wins Grammy for Best Rap/Sung Collaboration for No Church In The Wild. Jay-Z and West win Grammys for Best Rap Performance for Otis. Both Jay-Z and West were not present to accept the award. West and Jay-Z perform Otis at VMA’s from the album Watch the Throne. Jay-Z and Swizz Beatz wins Grammy for Best Rap Performance By A Duo Or Group for On To The Next One. Oh man, I got a lot of Grammys already. 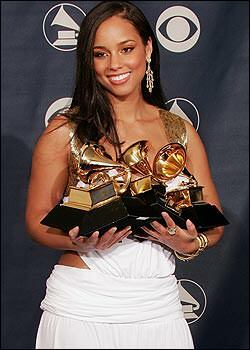 But this particular Grammywas super special because it was my first Grammy as an artist. Jay-Z and Keys wins Grammys for Best Rap-Sung Collaboration and Best Rap Song for Empire State Of Mind. Jay-Z discusses his life, the music business and lessons about both that he has learned along the way. He focuses on the difference between amazing vs. excellence. Also how to be comfortable with yourself. It was a moment in history. I knew then she’s one of the greatest. I was actually in the studio with Kanye in Hawaii when he played the concept for me. I was blown away. I had the opportunity to sit in the studio while Nicki wrote her verse just off the record. That was when she earned my respect as a lyricist. She was a dope entertainer up until that day that I sat in the studio and watched her come up with what I feel is one of the dopest verses of the year. Eminem ft Jay-Z perform Renegade and Not Afraid during The Late Show with David Letterman to promote Jay-Z album The Blueprint. Knowles and Jay Z perform Forever Young during the Coachella Music and Arts festival. Jay-Z wins Grammy for Best Rap Solo Performance for D.O.A. (Death Of Auto-Tune). Jay-Z, West, and Rihanna wins the Grammy for Best Rap-Sung Collaboration and Best Rap Song for Run This Town. Keys and Jay-Z performs Empire State of Mind at the American Music Awards from the album The State of Freedom. Jay-Z gives an interview to Oprah for O Magazine about being abandoned by his father when he was 11. [I felt] Anger. At the whole situation. Because when you’re growing up, your dad is your superhero. Once you’ve let yourself fall that in love with someone, once you put him on such a high pedestal and he lets you down, you never want to experience that pain again. So I remember just being really quiet and really cold. Never wanting to let myself get close to someone like that again. I carried that feeling throughout my life, until my father and I met up before he died. The line in this song ‘Just because I’m losing, doesn’t mean I’m lost‘ is what the whole record came out of, because we were feeling down at the end of the last tour. That line arrived and it was, ‘OK, that’s how we kinda feel. We know we can improve’. Rihanna and Jay-Z win the Grammy for Best Rap/Sung Collaboration for Umbrella. This is Rihanna’s first Grammy win. You don’t even understand. It is so exciting for me just to be nominated. Linkin Park and Jay-Z win the Grammy for Best Rap/Sung Collaboration for Numb/Encore. Thank you to everybody who threw their vote our way and thank you fans. Jay-Z wins the Grammy for Best Rap Solo Performance for 99 Problems. Jay Z and The Roots perform a full concert including the single Izzo (H.O.V.A.) during MTV Unplugged to promote their album Jay-Z Unplugged. Jay-Z wins the Grammy for Best Rap Album for Vol. 2…Hard Knock Life.